Shortly after the turn of the 20th century two Harvard professors developed a bell curve that has remained tremendously important in stress research to this day. 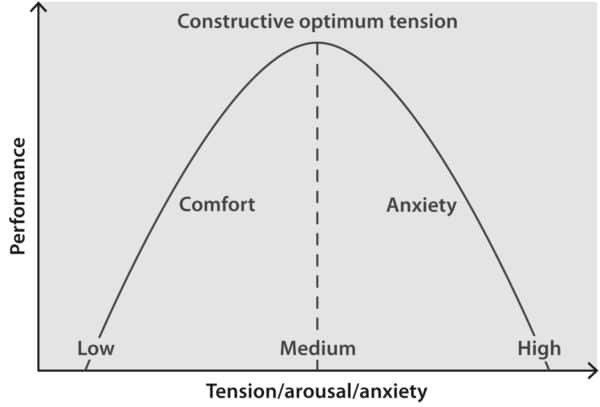 Their curve shows in very simple terms where our physiology is when we are relaxation or arousal. Our heartbeat, blood pressure, stress-related hormones, and many other bodily factors change whether are relaxed or stressed out. The curve doesn’t show any medical measurements because most body changes increase or decrease in a progression matching how much relaxation or pressure we are experiencing. We find ourselves somewhere on this path and we can only be at one point on the path not two, three, etc. Now we need to take Yerkes-Dodson’s nice linear path and put a hump in it to form the bell curve. At the top is the point of recognized peak performance. It is a mixture of moderate relaxation with moderate arousal (stress). If we are too low down on the peak, on the left-side of the peak, we have too much relaxation. If we reach the peak and start to slide down to the right, we have too much arousal. The sweet spots are at the top and around it. Flow, the special experience of sports people and anyone else who brings skill, work, and attention to the moment and focuses in, sits at the top of the peak. So this means we aren’t chasing after pure relaxation and avoiding arousal. If we pursued relaxation to its end point at the left bottom of the curve, we would experience extreme lassitude. If we pursue arousal to the far right side of the curve, we would be in pure panic. Yerkes and Dodson have given us a map. We can always ask ourselves: “Where am I on the curve right now?” If the answer is not where we want or need to be, then we can pull out a variety of tools to pick up our arousal or to tone it down. That’s where this blog comes in….showing you the tools to move you along the Yerkes-Dodson bell curve. Keep reading.